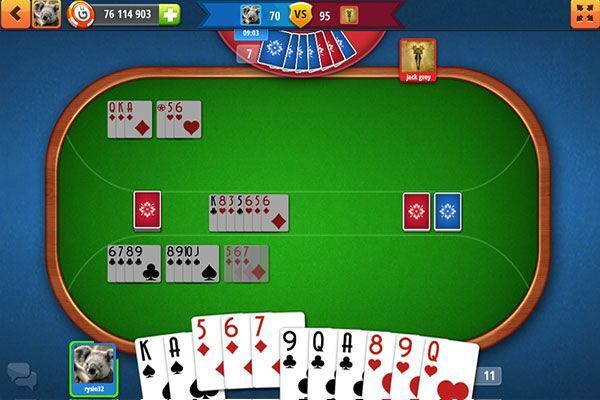 بوراكو – game rules. Gameplay – see how to play بوراكو on GameDesire! 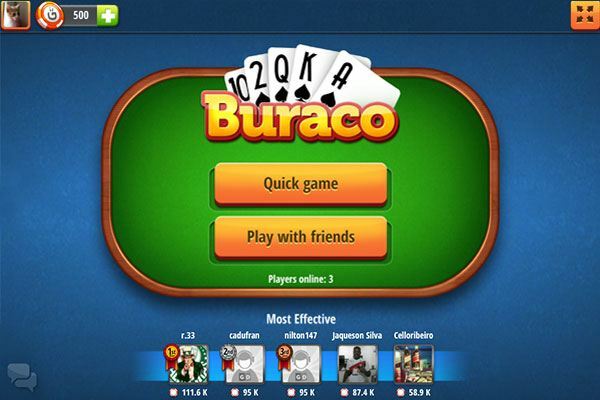 Buraco is a traditional card game, which comes from Uruguay and Argentina. It was invented in the 1940's. To this day, it is the most popular card game in South America, especially in Brazil. It is a rummy type card game, from the canasta family. It is worth mentioning that in Portuguese, "buraco" means "a hole", which is associated with the feeling of sadness after a failure. Buraco has several variants, the two basic types are Buraco Aberto (“open”), and Buraco Fechado (“closed”). Buraco Aberto can be played with 2 or 4 players. With two players, the game is played "1 on 1", with four players, it's played "2 on 2". When playing with 4 players, each pair puts their points together. The game is played with 2 decks of cards, with two jokers in each. There are a total of 108 cards. The main goal of the game is to have the highest score possible and being able to get rid of all your cards. 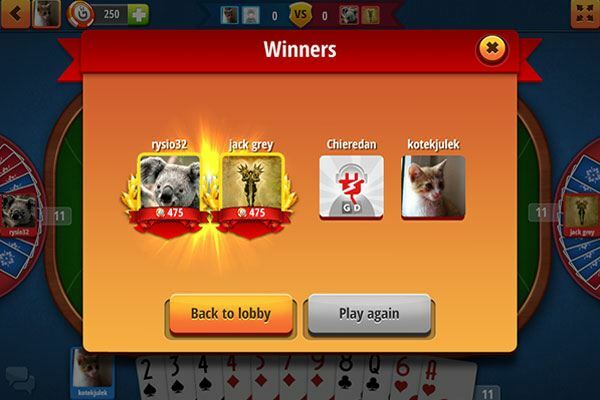 It is not enough to discard the first 11 cards to finish the game, like in classic rummy, because after that, the player gets another 11 cards from the dead pile. When a player has gotten rid of all his/her cards, the game is over. However, the winner is the player who has the most points, not necessarily the one who got rid of his/her cards first. The main components of the game involve melding and discarding. For every card melded, the player receive points. Additional points can be attained by melding special sequences (canastas). Negative points are also a possibility during the game. a player, (or one of the players when playing "2 on 2") not collecting from the dead pile before the end of the game (-100 points). Sequences are sets of at least 3 cards of the same suit, which players meld, for example: J ♥, 10♥, 9♥. In the game there are canastas – sequences composed of at least 7 cards of the same suit, in consecutive order. They give the player extra points. Melding canastas properly is considered to have a significant impact on the final score. In the game, there are special cards, called "wild cards", that can replace any other card. These are: "Jokers" and "2s". A sequence or canasta with a "wild card" is called "dirty" or "mixed". A player receives less points for "dirty" canastas than for "clean" canastas. Both "Jokers" and "2s" can be put wherever needed in a sequence or canasta. For example, when the sequence: J♠, 2♥, K♠ is melded, we can add to it the Q♠ in next rounds. After adding the card, the sequence would look like this: 2♥, J♠, Q♠, K♠. (2♥replaces the 10♠). The same rule applies to the joker. "2s" can also be just normal cards. It means that if we use a "2", (first as a wild card) in the same suit as the rest of the cards in a sequence, it can become a "clean" sequence. (Also, "dirty" canasta can become "clean" canasta). For example, if we add the 4♠ to the sequence: 3♠, 2♠, 5♠, the "2" can be moved to the beginning and the sequence will look as it follows: 2♠, 3♠, 4♠, 5♠. 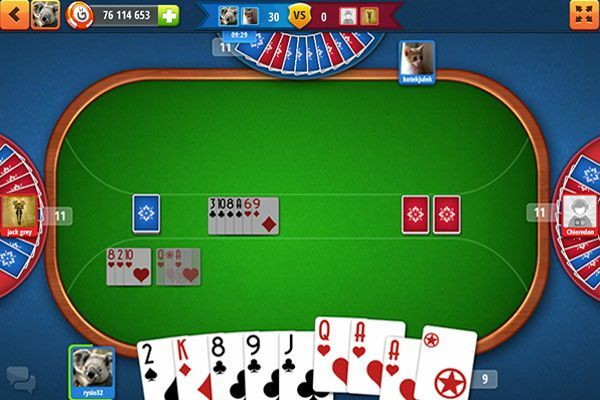 In the beginning, each player receives 11 cards. Two dead piles are formed with 11 cards each. Each dead pile is assigned to one player (in "1 on 1"), or to one team (in "2 on 2" ). Other cards form a stock pile. First, the starting player draws one card from the stock pile. Now the player can meld cards if it is possible to form sequences with them. If not, (or if the player does not want to do it now) he discards one card to the discard (“open”) pile. Discarding a card ends the round. In "1 on 1", each player has his/her own melds and is adding cards only to them. In "2 on 2" partners play together – they can add cards to those melded by their partner. During the next rounds, the players draw cards from the stock pile or from the discard (open) pile. After drawing, the players meld sequences and add cards to those already melded or simply discard one card. They need think about the best way possible to meld, to get the highest score. After discarding all 11 cards from his/her hand, he/she receives another 11 cards from the dead pile. Now, if the player can get rid of them, the game is finished. To discard the last card, the players need to have at least one "clean" canasta. The discard pile is a pile of cards that the players have gotten rid of. Players can decide which pile to draw a card from – the stock or the discard pile. If they choose the discard pile – the players have to take all the cards from the pile, not only the first one. All the cards in the discard pile are visible to the players. At the end of the game the player, who threw away the last card, gets 100 points. His/her opponent gets negative points for every card left in his/her hand – in accordance with values described above. The winner is the player (or the team) with the highest score.